I don’t know how it has been by you, but it has almost been a tease here in North Carolina – a nice warm day followed by a cold week and then warm again. I’m ready for the cold to be over and the warm weather to stay. I definitely have spring on my mind especially with getting back from the sunny west coast! One of my favorite things about spring, aside from the flowers blooming is the fashion, of course. Spring fashion is full of bright colors and fun patterns, such a breath of fresh air after living in black all winter! 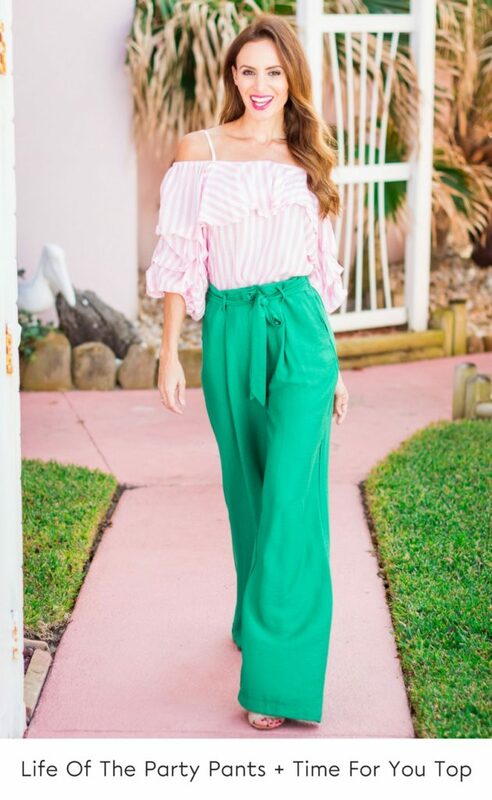 In preparation for spring we recently did a photoshoot with all our new spring arrivals from my store, Murph Boutique, down in Daytona, FL, at the beautiful Tropical Manor Hotel on the beach. It was the perfect setting for a photoshoot with all of their fun colors and the beach setting. It is such a cute, retro hotel that has been family owned for decades. The guests are super sweet too and many of them come back over and over, one family told us it has been there destination for 18 years straight! 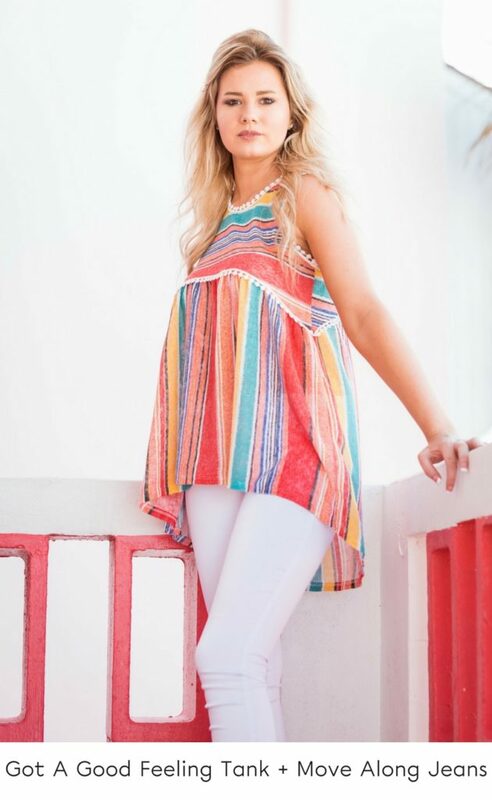 Whether you’re preparing for college Spring Break, planning a tropical family vacation or just looking to add some fun pieces to your closet, I wanted to share with all of you our new styles from Murph that are great starting pieces for spring and can easily be worn all summer long! Are you the cool and casual girl? Perfect! Our more casual pieces range from graphic tees with your bestie to wide legged pants that we can’t get enough of! These are the perfect outfits for brunching with your babes or shopping with your girls. Who doesn’t love a good romper?! They are so easy to throw on and go! Wear them with sandals for a causal look or slip on a pair of wedges for dinner. We love that these rompers are fully lined and really unique, I mean look at the gorgeous lace detailing! I LOVE, LOVE, LOVE dresses. They are my go-to and ours are effortless and chic. With details like ruffles, stripes and great colors, trust me, there is the perfect dress for any occasion. Maxis are perfect for transitioning into spring and summer. From fun tropical prints to ombre and great strap details these looks can take you from a girls lunch to dinner with your special someone. Layer them with a great denim jacket now and bare those sun kissed shoulders later! I’m currently obsessed with our new high-low polka dot maxis! Trust me you can pull them off, polka dots are huge for spring and the adjustable straps and elastic back ensure the perfect fit on everyone! Wide leg pants – I am so glad these are making a comeback because they are very flattering. They nicely hide any imperfections and the cut visually makes you look taller and your waist trimmer. Win, win! Seriously everyone that has tried them on is obsessed. Also, if you are shorter like me, add some great heels underneath and your legs will look a mile long! For the khaki pants, I paired it with a tropical top for a great resort chic look but it also pairs great with a white bodysuit and bold necklace. For the green pants I had to top them off with this fun pink and white top for a confident and statement making look. Last, but certainly not least, swimwear … because no Spring Break vacay is complete without your favorite swimsuits. One pieces are still a big trend this season and we especially love the lace up side detailing on this one! For our newest bikini we are obsessed with this dark lavender color. 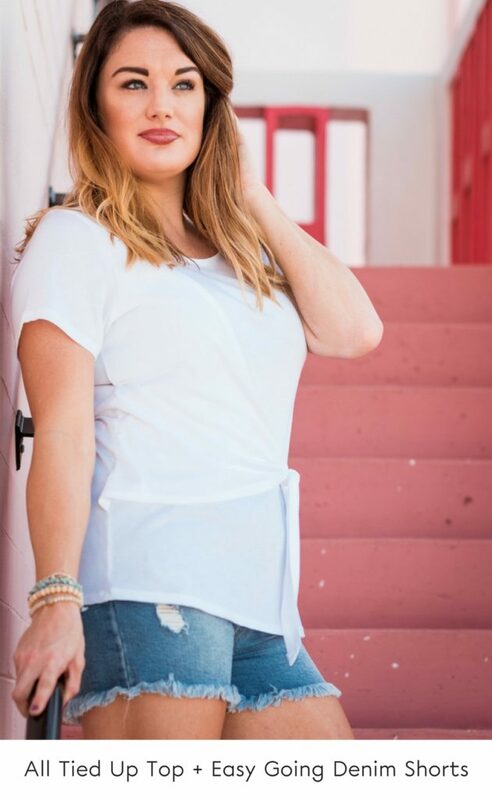 We love a good flow coverup that looks great with a suit or add a tank and shorts with it for another great outfit, pieces that you can get a lot of use out of are the best! You basically just got a sneak peek of what my entire spring wardrobe looks like. I am loving all of our new looks at Murph and I hope you do to! Comment with your fav pieces, styling questions or looks you want to see more of!